Members of the general public who have found themselves pootling about in Manchester’s Northern Quarter in recent months may have noticed the large face of a man unperturbedly peering at them as they pass by the corner of Tib Street and Thomas Street, very close to Piccadilly Records. To the unacquainted, this lifelike portrait of an unremarkable, bespectacled, middle-aged man might seem like a strange choice for a piece of art so prominently on view on the side of a substation in Manchester’s city centre. 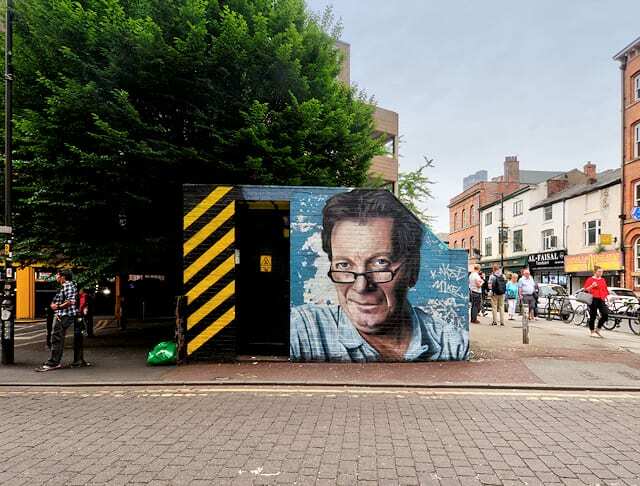 To the acquainted, it’s clear to see that this is a mural dedicated to famed Manchester music mogul Tony Wilson, former manager of Joy Division, New Order, and Happy Mondays, who died in 2007. The mural has been there since June of last year. The Tony Wilson mural is the latest work undertaken by Manchester-based street artist Akse, who originally hails from Paris. Since 2006, Akse has produced a number of realistic portraits of famous faces that have graced both the Tib Street substation and a structure located at Stephenson Square, only a very short walk from the substation. Among the figures that have received large-scale renderings on the sides of these two edifices is Manchester’s own Mark E. Smith, frontman of The Fall, as well as some icons with less apparent Manchester connections, such as Prince, David Bowie, and characters from Breaking Bad. Fellow graffiti artist Quebek has also contributed murals to both locations. Information about the aims and scope of this project can be found at www.outhousemcr.thecolouringbox.co.uk.